This is information crediting imagery, whether presently on this website or not. This is a single work that is an adaptation by combination in Gimp 2.18.16 of two original works described below as Abacus and as Magic Square. The adaptation was by me, Nick Levinson. The adaptation is licensed under the Creative Commons Corporation Attribution-ShareAlike 3.0 Unported license (<https://creativecommons.org/licenses/by-sa/3.0/legalcode>, as accessed March 12, 2017 (summarized at <https://creativecommons.org/licenses/by-sa/3.0/deed.en>, as accessed March 12, 2017 )) without thereby being sublicensed and without thereby restricting the terms of the license applicable to each of the original works. The original work is titled “Abacus 4.jpg”, is by Loadmaster (David R. Tribble) (who may be referred to in this paragraph as the creator of the original work), is under copyright (Copyright 2010 , apparently by Loadmaster (David R. Tribble)), and is licensed under the Creative Commons Corporation Attribution-ShareAlike 3.0 Unported license (<https://creativecommons.org/licenses/by-sa/3.0/legalcode>, as accessed March 12, 2017 (summarized at <https://creativecommons.org/licenses/by-sa/3.0/deed.en>, as accessed March 12, 2017 )). Another license may also be available for the original work, in accordance with a statement at <https://commons.wikimedia.org/wiki/File:Abacus_4.jpg>, as accessed March 12, 2017 . 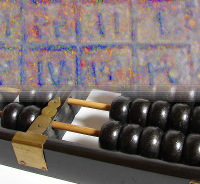 The original work was downloaded from <https://upload.wikimedia.org/wikipedia/commons/b/be/Abacus_4.jpg>, which was accessed via the “2,816 × 2,112 pixels” link on https://commons.wikimedia.org/wiki/File:Abacus_4.jpg (where copyright and licensing information for the work was stated and where the description of the original work includes “Chinese abacus” with photography data and a date of March 22, 2010 ), both URLs as accessed on March 12, 2017 . The original work as downloaded for this website (the work that is as of August 24, 2011, 7:58 a.m. ) was then adapted in Gimp 2.18.16 by being rescaled to a smaller size, cropped, made less opaque at the top (opacity set differently in each horizontal band), and, as described above, combined. The adaptation is not a distortion, mutilation, modification, or other derogatory action in relation to the work which would be prejudicial to the honor or reputation of the creator of the original work; it is my intention that the adaptation may enhance the honor and reputation of the creator of the original work by adding to the use of the original work. There is no connection with or sponsorship or endorsement by Loadmaster (David R. Tribble) of me or my use of the work. The original work is titled “Yuan dynasty iron magic square.jpg”, is by BabelStone (which name may be a pseudonym and who may be referred to in this paragraph as the creator of the original work), is under copyright (Copyright 2011 , apparently by BabelStone), and is licensed under the Creative Commons Attribution-ShareAlike 3.0 Unported license (<https://creativecommons.org/licenses/by-sa/3.0/legalcode>, as accessed March 12, 2017 (summarized at <https://creativecommons.org/licenses/by-sa/3.0/deed.en>, as accessed March 12, 2017 )). The original work was downloaded from <https://upload.wikimedia.org/wikipedia/commons/2/2d/Yuan_dynasty_iron_magic_square.jpg>, which was accessed via the “1,653 × 1,502 pixels” link on https://commons.wikimedia.org/wiki/File:Yuan_dynasty_iron_magic_square.jpg (where copyright and licensing information for the work was stated and where the description of the original work includes “[i]ron plate with Arabic numbers arranged in a 6 × 6 grid to form a magic square adding up to 111 horizontally, vertically[,] and diagonally (28, 4, 3, 31, 35, [&] 10; 36, 18, 21, 24, 11, [&] 1; 7, 23, 12, 17, 22, [&] 30; 8, 13, 26, 19, 16, [&] 29; 5, 20, 15, 14, 25, [&] 32; [&] 27, 33, 34, 6, 2, [&] 9)”, “Yuan Dynasty ( 1206 - 1368 )”, and “[d]iscovered at Xi'an, Shaanxi Provine [sic] . . . 1956 ” and with photography data and a date of August 2, 2011 ), both URLs as accessed on March 12, 2017 . The work as so downloaded was probably not the work’s original version credited to BabelStone (the work that is as of August 24, 2011, 7:58 a.m. ) but the work’s version credited to user Soerfm (the work that is as of July 22, 2012, 4:37 p.m. ). The work as downloaded for this website was then adapted in Gimp 2.18.16 by being cropped, rescaled to a smaller size, lightened, made less opaque at the bottom (opacity set differently in each horizontal band), and, as described above, combined. The adaptation is not a distortion, mutilation, modification, or other derogatory action in relation to the work which would be prejudicial to the honor or reputation of the creator of the original work; instead, it is my intention that the adaptation may enhance the honor and reputation of the creator of the original work, at least by adding to the use of the original work. There is no connection with or sponsorship or endorsement by BabelStone of me or my use of the work. This page’s principal nonadvertising content was prepared before and on January 28, 2016 , and revised through August 15, 2018 .